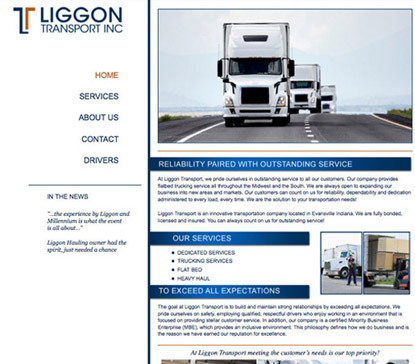 Content Managed Website developed for Liggon Transport. The owner of this over the road trucking company, located in Evansville, IN., requested an open, clean website design to represent his company. Keith requested this website design, be Evansville based, easy to navigate and read clearly along with a strong use of his businesses colors. All of these requests help with consistent brand development. Using a stark white background made the navy blue and deep orange of Keith’s logo stand out. 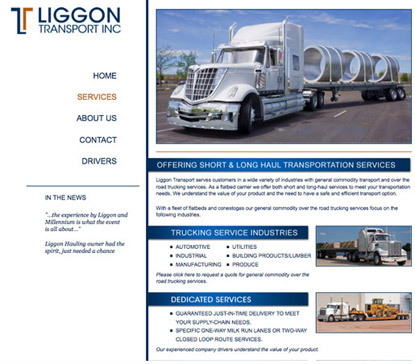 The Liggon Transport website was designed to not only be informative but we also wanted it to showcase his state of the art capabilities and diversified staff. Keith’s accomplishments have been recently locally recognized. In order to feature the Evansville Courier and Press articles, I utilized the left sidebar to feature this websites news real. This allows the information to be just a click away at all times. This trucking website features several areas of service. Keith, President of Liggon Transport, decided to feature the information in a “to the point” manner using descriptive lists, allowing the information to be clearly accessible and easily understood. 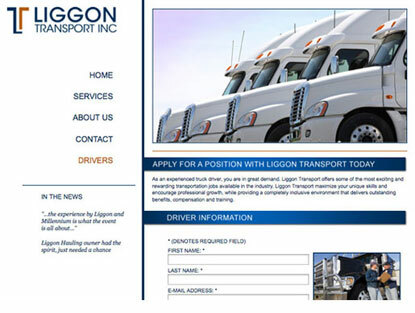 To make applying for a position within Liggon Transport easy we added a separate page strictly for drivers. When this form is filled out it is clear to the Liggon Transport staff what page it came from and who sent the information, making their employment search more efficient.